Hi Friends: It's time for a new challenge over at the SheepSki Designs Challenges Blog! The theme for this month is Anything Goes. I love these paper pads from MME - they always have matching brads and accessory packs, and this word sticker seemed perfect for the card! Print image onto smooth white cardstock and color with Spectrum Noir markers. Cut MME papers to fit A7 card base, ink edges, and add to card base as shown. Edge seams with white lace. Die cut image and patterned paper frame with the Labels Twenty dies, then ink edges, and glue image panel to frame. Add clear Glitter Brush pen to butterflies. Add brads to frame, then use foam squares to add image panel to card center. Color dimensional butterfly stickers with the same markers used to color the ones in the image and adhere to card. 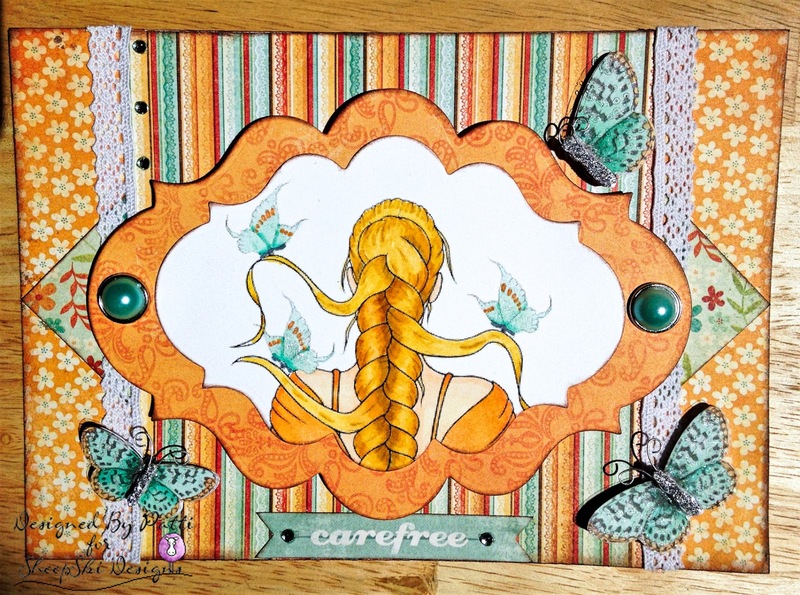 Add sentiment sticker, then finish with some gems along the left side of card and corners of the sentiment sticker. Super pretty card! I love how the colors blend together. Great use of color. Your work is always so inspiring.